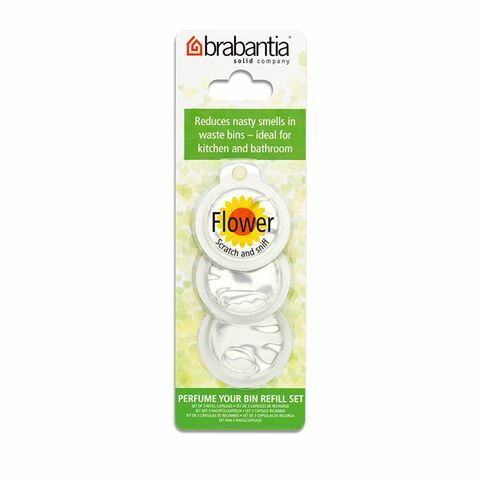 Worry not, because Brabantia's Bin Perfume Capsules are here to reduce unpleasant odours and keep your home delicately scented with aromas that will captivate your senses. With a lovely floral scent that is sweet yet subtle, Brabantia's Bin Perfume Capsule Set is designed to sit on the underside of your bin's lid. Simply remove the foil tab from the back of the capsule to activate the fragrance, and it is there that is will remain until the time comes that it needs changed - in which case you can use one of the other two capsules in the set. Ideal for use in the kitchen and bathroom, this set of three capsules will keep your home smelling like a garden in full bloom. Reduces unpleasant odours in waste bins. Scented with a sweet, floral fragrance that lasts 4 to 6 weeks. Remove the foil from the back of the capsule and stick the capsule to the underside of your bin's lid. Designed for use with a Brabantia Pedal bin. Presented as a set of three.